On September 5, Nubia released its flagship Z18 in Beijing. At present, this smartphone is on sale and the 6GB+64GB version is priced at 2,799 Yuan ($408) while the 8GB+128GB version has a 3,299 Yuan ($481) price tag. Some days ago, a video appeared on Weibo which shows a new Nubia device with a dual display. 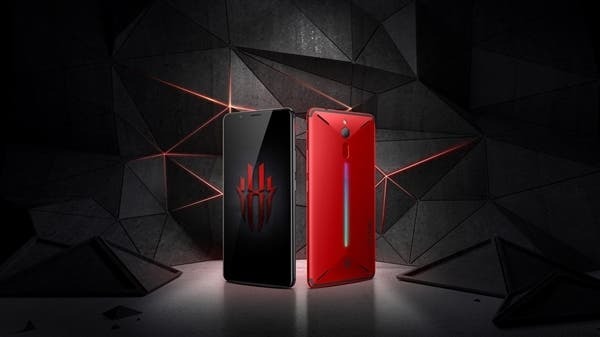 Many think that this is the Nubia Z18S but this is absolutely nothing like the Nubia Z18 and we will not be surprised if the company decides to start a whole new series with this one. Today, this dual-display smartphone appeared on TENAA and more of its specifications have been brought to light. 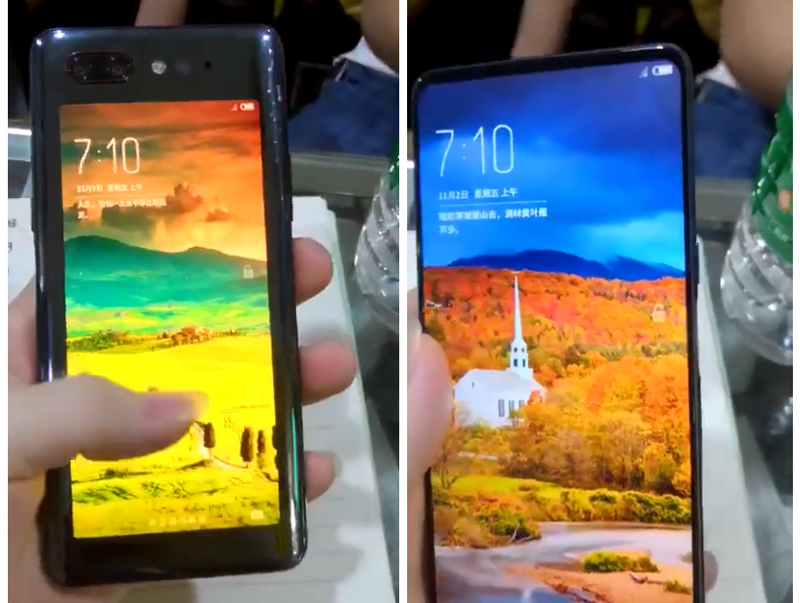 Looking at the TENAA model number of this smartphone (NX616J), it is very similar to that of Nubia Z18 (NX606J) which sparks the rumor that this dual-screen phone is the Nubia Z18S. From the TENAA listing, this device comes with a dimension of 154.1 x 73.3 x 8.65mm and weighs 178 grams. It is equipped with a 6.26-inch LCD primary display and this screen has a resolution of 1080 x 2280 pixels. On the rear, we have another 5.1-inch OLED panel with a display resolution of 720 x 1520 pixel. Its lights are kept on with a fairly large 3,800 mAh battery. Well, both displays will not be active simultaneously, this battery is not that bad. This smartphone will be powered by an unspecified 2.649GHz octa-core processor (most-likely the Snapdragon 845) coupled with 6GB/8GB of RAM and 64GB/128GB of internal storage. The smartphone will run on Android 8.1 Oreo out of the box. 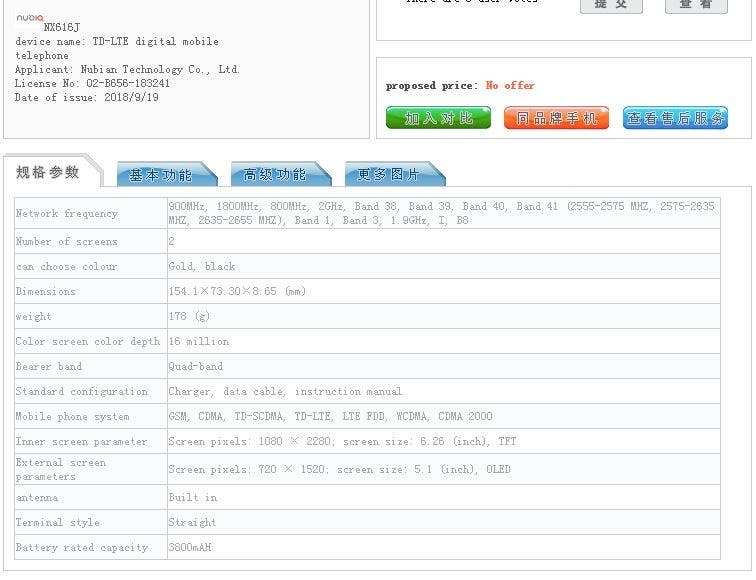 In the camera department, the TENAA listing shows that this smartphone will come with two cameras. A 24MP main snapper which is dupported by a secondary 16MP shooter. It is most likely that both camera’s will be placed above the smaller display as we have seen in recent leaked videos.